Writers have always known that creative inspiration isn't enough; you have to stay organised. Many of us turn to notecards, coloured pens and stickies. Scenes and plotlines are pinned to a wall, and then rearranged. A writer might also use coloured cotton strands or stickers to maintain character development or subplots. Fortunately for Mac users, there is SuperNotecard, which does all of the above on your Mac's screen. You start by opening up a new project, on which there are three decks of notecards assigned 'beginning', 'middle' and 'end'. Double-click a deck and a new notecard is formed within it. You then assign the card a scene, add notes, create another card, and so on. It's all flexible and the number of cards you can have running is unlimited. You can drag and drop to rearrange things and refine the plot as you go along. What's more, you can add colour markers to create plot relationships or character development lines, review cards that reference one factor, invoke a keystroke to enable your own shortcuts, flag amendments, and even assign a visual timeline of plot tension. Do this for the middle and end of your project, and you've essentially produced your first skeleton of a draft. Where SuperNotecard excels is in its export and printing abilities, which enable a smooth passage from the sketch to the longform version. Exporting to a word processor is a snap, with simple preferences on hand to keep your notecards in order. Overall, SuperNotecard is a useful and refined writer's friend. 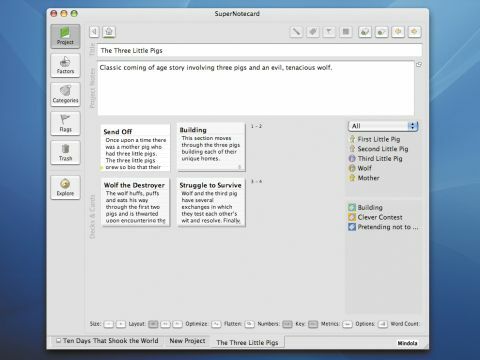 Those specifically interested in writing for the screen should also check out SuperNotecard for Scripting (around £17), which for an extra couple of pounds features the ability to export to Final Draft format, which SuperNotecard doesn't offer.